Maison Manesse was far, far up on my list, when Poul and I was in Zurich in September. I tried to book a table online, but I got an email back saying that they were fully booked that night and that they would let me know if anything changed. I didn’t hear from them, so I started looking for other options. Though Friday evening, I decided to give it one last shot and gave Maison Manesse a call. It turned out that they just had a cancellation, so I got a table after all, yay! On GoogleMaps, it looked like Maison Manesse was just a quick walk from the hotel, but in real life, it was quite a hike. Furthermore, it also started raining, and we got lost in the area around Google’s offices…Google, of all places! When we finally made it to the restaurant, we really needed a drink. Before even looking at the menu, we therefore ordered each our infused gin the size of a fish bowl. Now let’s have a look at the menu. Maison Manesse has a vegetarian tasting menu and a tasting menu with meat, but we couldn’t decide, so we ended up ordering la carte, as there were both meat dishes and vegetarian dishes we wanted to try. And what a meal! Poul claims it’s the best dinner he’s had in 2017, and I wouldn’t hesitate to put it among my Top 3. Before the food started arriving at the table, we were served a Szechuan button, which is a dried flower with super powers. When you chew it, you get this crazy sensation in your mouth, as if your taste buds are on ecstasy, and the following minutes you can’t do anything else than just gasp for breath. I had Szechuan button before in Las Vegas, so I knew what was coming, but Poul was caught completely off guard. You should have seen the expression on his face! *lol*. Baby artichoke and olive: The “olive” was actually a re-composed olive with a jelly-like texture. A very nice snack to start out with. Beetroot with goat cheese and chia seed pudding, fermented pear and fennel. A bit boring. I would have preferred the sharp taste of goat cheese to be more prominent. 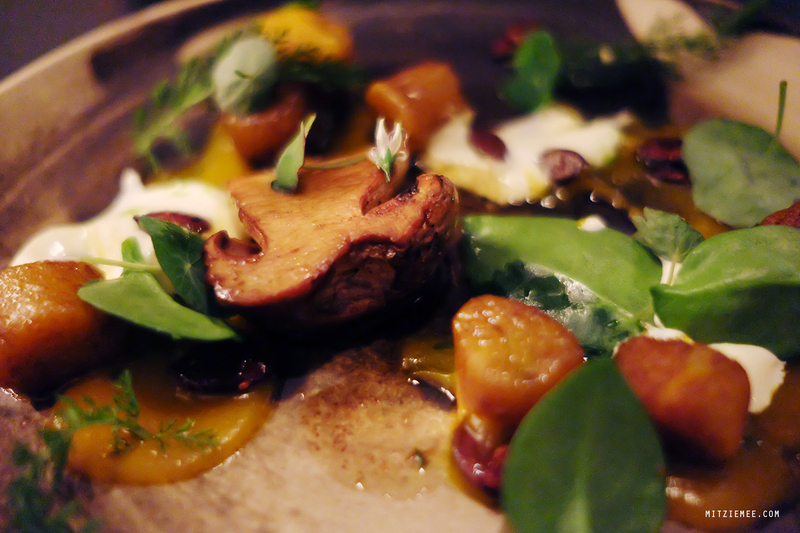 Pumpkin gnocchi with porcini, candied pumpkin seeds and foraged herbs. Venison entrecote with celeriac, trevisano, blackberries and chocolate. The chocolate and the blackberries were super tasty companions to this perfectly cooked piece of meat. Lobster tail with Jerusalem artichoke chutney, white peach and yabby mayo. You can’t really mess up lobster. This was delicious! A little too strong and cheesy for a recently converted cheese monster like me, but Poul loved all of it. Compressed melons with soya yogurt, champagne and sandthorn granité. The only dish that fell short. Not very pretty, almost a little tacky, and the champagne and melon combo didn’t work. Should have gone for the chocolate tart instead. Maison Manesse has one Michelin star (2017) so I guess it’s a fine dining place. Though it’s the new kind of fine dining, which is more hip and fun, and less white table cloths and expensive wines. The staff was great too, and they weren’t afraid of providing their personal opinions and recommendations, such as when Poul asked the waiter for a recommendation of a dessert wine and she answered without hesitation and left no doubt that this was in fact the wine she would have ordered herself, if she were dining here. Great restaurant, will definitely be back! What to eat in Zurich?